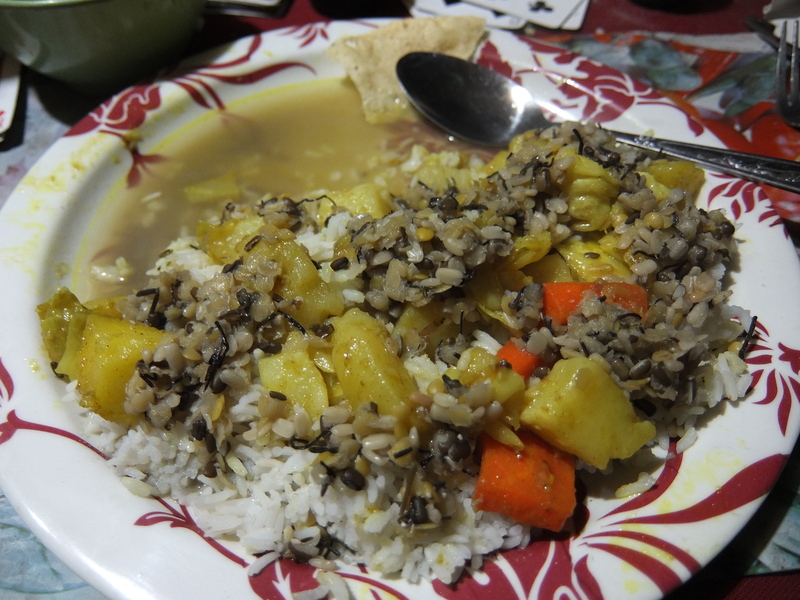 Dal Baht is simply what Nepal lives on. It’s the energy of the country, it’s the fuel that fills the bellies of the mountain giants, it’s delicious, and it’s every budget travellers dream. 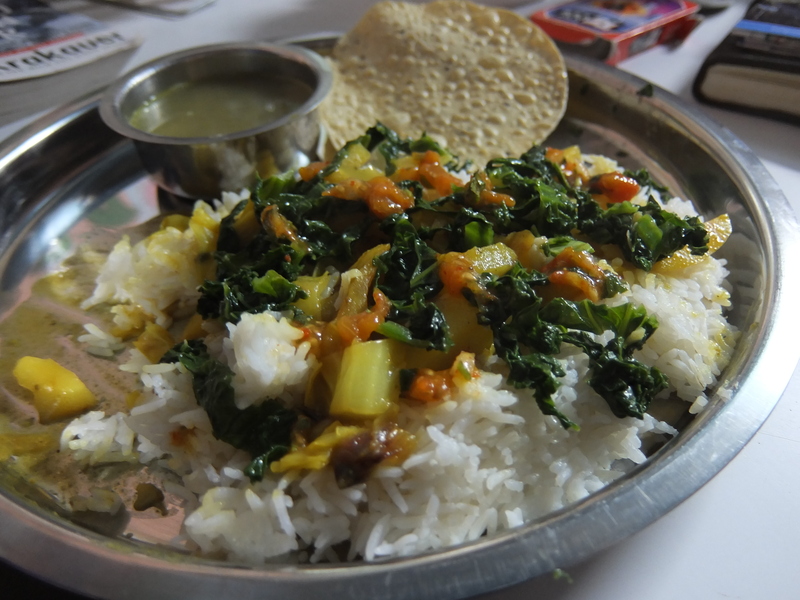 Dal Baht for a large number of Nepalese is simply the staple dish of the country. Dal Baht for breakfast, Dal Baht for dinner, maybe even throw one in for lunch if necessary. Besides Tsampa in Northern Nepal and much of the Himilayan region it’s Dal Baht that is typically favoured and enjoyed everywhere. This obsession with the dish isn’t just pandemic to the local society, travellers, and especially trekkers also incline towards this dish on a daily basis for its size, taste, and price. Dal Baht – which translates literally to Dal (lentil soup) and Baht (rice) is a dish with a similar framework throughout the country, but incredibly varied in its final product. 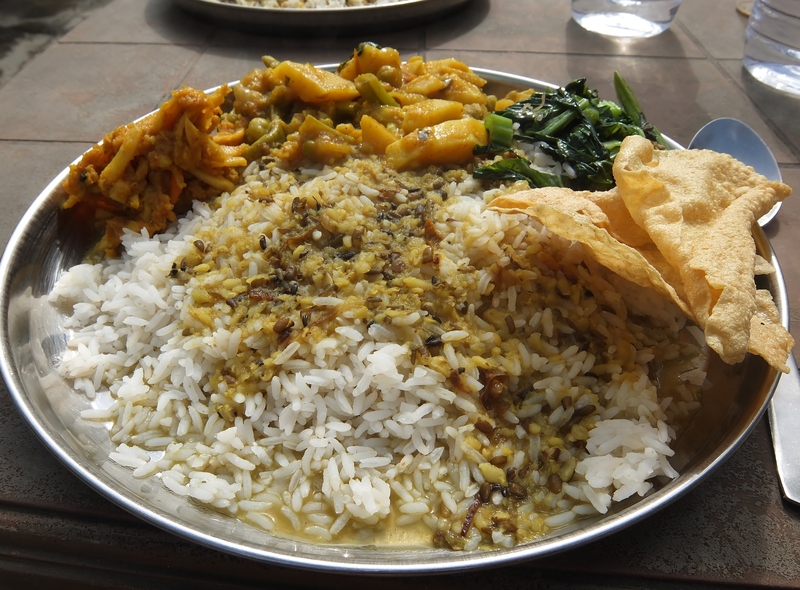 Typically Dal Baht comes with Dal soup, vegetable & potato curry, papad (Nepalese style bread), Nepali pickles, yogurt (in cities) and spinach or a vegetable side all around a mountain of rice in the middle of the dish to bring it all together. However, depending on your region, availability of crops, and personal preference of the chef these items can be switched, altered, or negated in any creation of Dal Baht. As long as there is rice, dal, and one side (generally curry), it’s Dal Baht. Dal Baht is traditionally eaten with ones hands. The Dal is poured over the rice and sometimes curry as well (although this differs), into a massive mixture. Using the right hand (as the left is dirty for other reasons) one must make a sort of three-finger hoe and scoop the rice, dal, and curry mixture and deposit it into ones mouth. Of course, with sticky rice you have the ability to manufacture a sort of temporary rice spoon and use this as your container for dal and curry. For most people who aren’t used to eating with their hands the entire experience is very fun and adds an interesting twist on sometimes a bland dining experience. Dal Baht gains is popularity amongst travellers for a few simple reasons. 1) It’s a complimentary blend of many different foreign flavours 2) it’s generally cheap, and 3) you ALWAYS get a refill! Reason number 3, at least from my experience if the chief concern for Nepalese and Westerners alike. After waking up at 6:30am, gulping down a porridge and hitting the trail for 6-8 hours there’s no other dish that even comes close to satisfying that increasing hunger. Not to mention carbo-loading for your hike the next day! If you’re trekking the popular phrase, “Dal Baht power, twenty four hour” can be heard and found in almost any village – and it’s true. 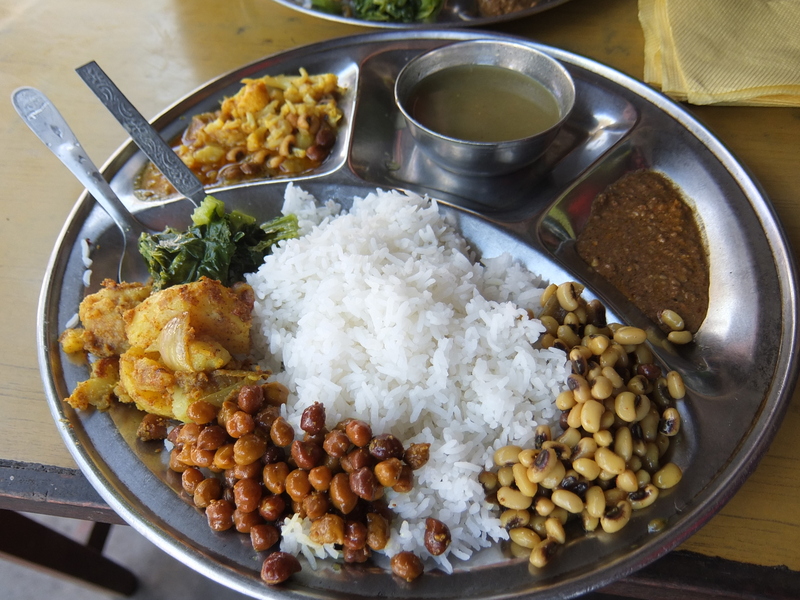 For many Nepalese, who eat 2 meals per day, it’s the perfect staple to provide a blend of carbohydrates, vegetables, and well… it’s mostly carbohydrates but it fills the belly and it’s not too terrible for you. In major cities and towns, and most anywhere that’s not part of a major trekking route in the Himalayas, the dish costs anywhere from 120rp – 200rp ($1.20 USD – $2 USD). As you gain altitude trekking, the price inflates and adjusts to the cost to carry the supplies that high. Dal Baht on the Annapurna Circuit, Annapurna Sanctuary, and Langtang treks can get as high as 700rp in the highest camps. Personally while trekking I consume at least one Dal Baht per day and typically for dinner since you need a solid 30-minutes to recover from your food coma, which makes it unfeasible for lunch (sometimes). 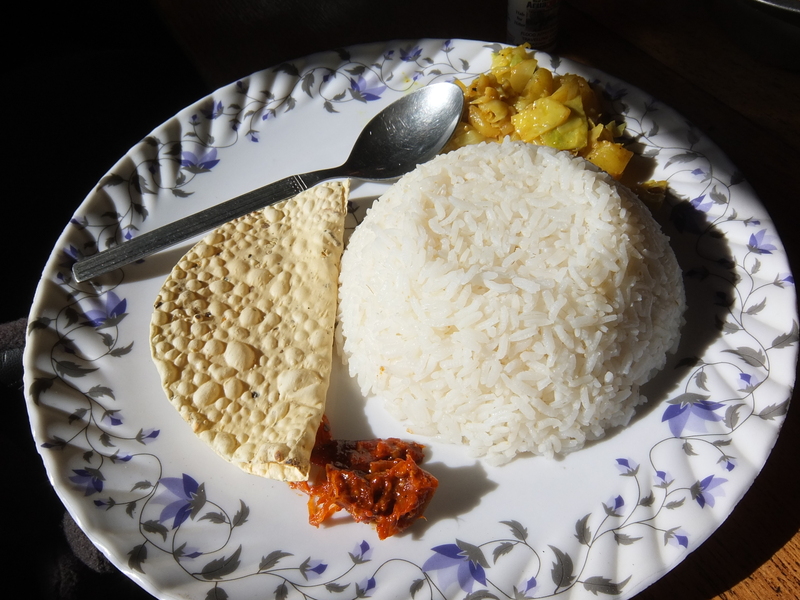 When I’m not trekking I find it difficult for go 2 days without one serving of dal baht, and I rarely manage to do this. It’s incredibly simple, it’s absolutely delicious, it’s enjoyed by young, old, local and foreigner alike, and… as I said, you get a refill.